With the widest product range in the market, Fullchance can deliver rubber sheeting and rubber matting, quickly and reliably for all areas of use. Common applications include sealing, bearing parts and protection. Our extensive range of rubber mattting products is suitable for most uses and is extraordinarily tough in all applications like public places as rooms, shops, restaurants, stairways, entrances, airports, buses etc. Smooth on one side + cloth impression on the other side. Cloth impression on both sides. Other special designs on one or both sides. Sheets available in rolls, strips, plates o tiles. Thickness from 0.2 mm to 50 mm. Widths available up to 2000 mm. With more resistant to ageing, temperature and middle pressure, water-proof, anti-shock and sealing etc. General purpose rubber sheeting mainly used as sealing gasket, sealing strip, it also could be put on the workbench or used as rubber matting. With Excellent resistance to oils, solvents and fuels. Resistant to a broader range of aromatic hydrocarbons than neoprene. Nitrile may be blended with SBR rubber to achieve an economically priced sheet or moderately oil resistant applications. Temperature range: -30°C to +120°C, with the possibility of reaching -40°C. Good resistance to heat, ozone and weathering. Resistance to chemicals; resistant to inorganic chemical products , except oxidising acids and halogens. Excellent resistance to ozone, sunlight and oxygen. Excellent resistance to acid, alkali and ketones. Excellent inherent high and low temperature ranges. Typically -45°C to +120°C for standard compounds. Excellent resistance to ozone, oxidation and sunlight. Has very low resilience which makes it ideal for vibration damping and shock absorption applications. Resistance to chemicals; resistant to most inorganic products. Highly resistant to mineral acids, alkalines and aqueous acids. Excellent resistance to oxidation and has outstanding resistance to atmospheric conditions an in particular strong sunlight and ozone. CSM compounds resist fire and are self extinguishing when the flame is removed. Resistance to chemicals; resistant to most inorganic chemical products, good resistance to general acids, oils and greases. Silicone rubber is good on surface, high stability and durable. Excellent in softness, elasticity, insulation, air tightness, ozone resistance, weather fastness and alcohol, animal/plant oil and polar organic resistant. Silicone rubber is widely used for membrane press of solar energy lamination machine, wooden and glass industry. Viton is serviceable in continuous heat of up to 250º C and intermittent heat of up to 300º C.
Satisfactory resistance to low temperatures of typically -20º C and - 40º C by use of special grades. Good flame resistance and are usually self extinguishing upon removal of flame source. Have excellent resistance to oxygen, ozone and natural weathering. Good gasket material due to excellent physical properties such as resilience, tear strength and wear resistance. Natural rubber is used effectively as sand and shot blast curtain material because of it's high abrasion resistance and resilience. Other specification available as special order. 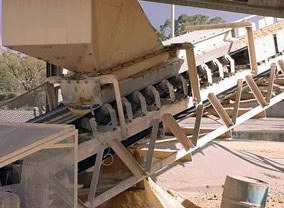 Conveyor Belt when slips causes significant damage to the drive pulley and the belt. Such damages are not only expensive to repair, but also time consuming and cause enormous loss due to down time. The life span of a conveyor system primarily depends on its being suitably equipped for the specific application and the standard of servicing and maintenance. The conveyor systems often have to perform in the most difficult conditions.For example rain and sludge, which cause slippage between the conveyor belt and pulleys because of the friction co-efficient between the two going down very low. Pulley Laggings, with specially developed rubber materials and their patterned surfaces have proved to be very effective in water shedding, preventing material build up and controlling belt slippage. Diamond Profile black lagging is ideal for small diameter pulleys on systems with black conveyor belt. It prevents belt from slippage (in particular when water is present) and increase the drive traction of the pulley. For Drive pulleys, a friction lagging should always be used. The type of friction lagging should be selected by the customer according to its application.